Wow!!! Just Wow!!! Words cannot describe how incredible this album is! As a diehard fan of all things Jim Peterik expectations were very high for this album. The man is an amazing and very versatile songwriter and no matter who or what he is writing for always brings his A game whether it be Survivor, Pride of Lions, solo Work, Ides of March, or any other artists. Pride of Lion’s however is in a league of it’s own. 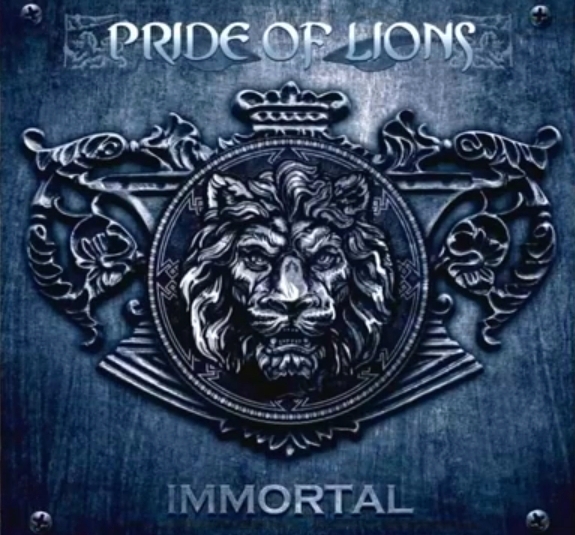 Who would believe that a man in the twilight of his career comes out with the best and most inspirational songs of his career and that is just what Pride of Lion’s is… Inspirational, even to the point of sometimes even borderline Christian Rock. As great as Jim is he of course cannot be given full credit for the albums greatness and at this point I must acknowledge his partner young lion, Toby Hitchcock! I have said it from the very first POL album… THIS BOY CAN SING!!! Every album he somehow seems to get better and better and on “Immortal” he gives the vocal performance of his career! Even, dare I say it, the greatest vocal performance ever put on a rock record! Powerful and from the heart!!! 1.) Immortal– The album kicks off with a bang! The title track Immortal holds some of the most inspirational lyrics Jim ever wrote. Great chorus, great bridge, great song!! 2.) Delusional– The debut single from the album and again very beautiful and inspirational lyrics. 3.) Tie Down the Wind– Wonderful mid-tempo song. 4.) Shine On– I absolutely love this song! Starts out slow and ballad like but picks up speed and transforms into a sensational mid-temp rocker! Wonderfully Brilliant!! Love the arrangement of this masterpiece! 5.) Everything That Money Can’t Buy– The first ballad of the album and it’s Beautifully Brilliant! By rights this should be a hit single. 6.) Coin of the Realm– Here we have Jim revisiting the old Survivor Days! Very reminiscent of “Eye of the Tiger”. Definitely recommend putting this one on your Exercise playlist! Great Guitar riff, great chorus! 7. )Sending My Love– The second of three ballads and my personal favorite! Just Beautiful! 8.) Vital Signs– Here is the song I was most curious about. This was intended to be the title track of Survivors pitch perfect “Vital Signs” album but according to Jim just wasn’t ready, but after 25 years is finally complete and well worth the wait!! Awesome Rocker!! Great guitar work, great melodies, great chorus, great bridge!! Great song! 9.) If It Doesn’t Kill Me– This song really spoke to me and has become very personal in my present station in life, but aside from that is quit possibly one of the greatest songs ever written! Big Rocker, Huge Chorus, Amazing guitar work. The perfect song! Already song of the year! No Competition!! 10.) Are You The Same Girl- Last of the three ballads. Very moody and a bit theatrical. 11.) Ask Me Yesterday- A great way to end the album! Big rocker, reflecting on the past but looking to the future. Another huge chorus! More great guitar work!